You gasp in dismay as your ring goes down the drain--but all's not lost. If you have a bucket and channel-type pliers or a wrench, you may be able to rescue precious jewelry or even a contact lens. A sink drain has a U-shaped pipe underneath it, called the P-trap, which captures most items that fall in. You gasp in dismay as your ring goes down the drain--but all's not lost. If you have a bucket and channel-type pliers or a wrench, you may be able to rescue precious jewelry or even a contact lens. A sink drain has a U-shaped pipe underneath it, called the P-trap, which captures most items that fall in. Shut off the faucet immediately so the object does not flow past the P-trap. Look underneath the sink to locate the P-trap. In most cases, the P-trap is easily accessible. If it is not, you might need to call a plumber. Note that some older sinks have a drain plug at the bottom of the P-trap. If your sink has this, you will still need to remove the P-trap to retrieve your item. This drain plug, intended to aid cleaning the P-trap, is probably too small for your dropped item to fit through. Move a bucket beneath the P-trap to capture any debris that flows out after you remove it. Use the channel-type pliers or a wrench to loosen the P-trap's slip nuts (see <a href="http://www.ehow.com/how_117443_clear-clogged-sink.html" target="_top">How to Clear a Clogged Sink or Tub</a>). Tape the ends of the pliers to prevent scratching of chromed pipes. Once you've loosened the slip nuts, unscrew them by hand. Allow the contents of the P-trap to fall into the bucket as you remove it. Hair, dirt and slime gather in the P-trap, so expect a fair amount of icky sludge to drain out of it. Don rubber gloves and search the dirty water in the bucket for the item you dropped. If you can't find the item, wash out the P-trap with hot, soapy water and a scrub pad to remove buildup that might be hiding your item. Once you have found the item, replace the P-trap and tighten the slip nuts. 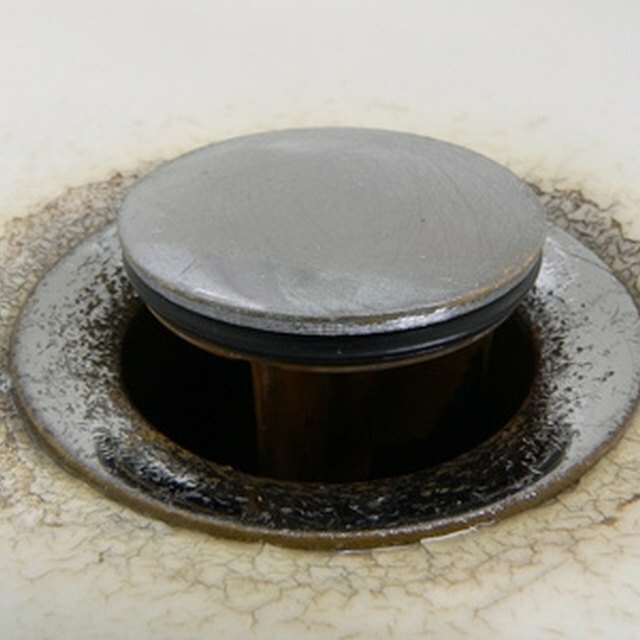 If you've dropped an item down a sink that has a garbage disposal, exercise extreme caution. If the item is visible, use a wooden spoon or tongs to retrieve the item from the garbage disposal. If the item was caught in the grinder, it's probably a goner. Contact a plumber. If the item you've dropped is magnetic, try dangling a magnet tied to a string down the drain to retrieve the item. While most jewelry is not magnetic, sometimes a steel clasp will provide the necessary magnetism to make this work. Use a mesh drain guard to prevent future loss of valuables down the sink. And keep a ring holder near the sink if you remove your rings to wash dishes. Keep in mind that periodic removal and cleaning of the P-trap can help prevent clogged or sluggish sink drains. Also, if the P-trap is leaky or corroded, you might want to replace it. Use a mesh drain guard to prevent future loss of valuables down the sink. And keep a ring holder near the sink if you remove your rings to wash dishes. Keep in mind that periodic removal and cleaning of the P-trap can help prevent clogged or sluggish sink drains. Also, if the P-trap is leaky or corroded, you might want to replace it. What Is the Cheapest Roofing Material?